The Sanus XF228 Full-Motion Wall Mount has dual extension arms which can hold flat panel displays from 42-90" (106.7-228.6 cm). The ultra-light extruded aluminum wall plate uses QuickConnect for simple mounting and can support up to 200 lbs. FollowThru cable management keeps your cables concealed and ProSet adjustments make it easy for a perfect installation. Box Dimensions (LxWxH) 38.0 x 26.5 x 7.0"
XF228 Full-Motion Wall Mount is rated 4.6 out of 5 by 21. Rated 5 out of 5 by Musicfan from Great design with one asterisk This a very well designed product, and I can imagine after the first time a pro installs one, it would be their preferred choice for a fully articulated mount. That said, my asterisk on this great product is for the do-it-yourself home installer, and concerns the lag bolts. The installation manual instructs you to drill 3/16" holes for the 5/16" lag bolts and IMO the supplied lags can too easily be over-torqued and broken. The instructions caution not to over-tighten once reaching the washer but one of of my lags never made it that far and broke with a half inch left to go. I suspect what the pros know is to either drill the standard hole for a 5/16' lag bolt (which is 7/32') and/or they use a stronger lag bolt of their own purchase, which certainly worked for me. Rated 5 out of 5 by Audiophile from Truly great product for big screens This is perfect for anyone wanting to put a large, heavy monitor on the wall. It is actually quite easy to install, with good instructions and plenty of hardware to accommodate any LCD or plasma with a flat or round back. Allowing me to center the mount on a wall with off-center studs is great in itself, and so is its ability to hide cables. It is very easy to move the monitor according to ones needs, but another important aspect is that the mount looks good when the set is pulled away from the wall. This is very important because you can barely see a mount when the monitor is against the wall, but when you pull the monitor out--and that's the point of an articulated mount--the XF228 looks really good, very clean. This is a very well made mount that is essential for big heavy sets like the 60" Elite or the 65" Panasonic plasma. Rated 5 out of 5 by phdav from Problem solved This bracket along with most all of the Sanus brand mounts is purely a quality piece. I have been installing TV's since before flat panels were available. This is by far the first time everything has been addressed. I do not think there will ever be a magical way to route cables on a swing arm but this one does a pretty good job. Try and plan on using an AV receiver to do your video switching so you only need one HDMI and you will be good to go. It is on the pricier side of this type of mount BUT you do not want to go with a cheapy for this type of thing because you get what you pay for. Rated 5 out of 5 by samchampion from Sturdy and strong wall mount Wasn't sure if this would work for our set up, but it is working really well! 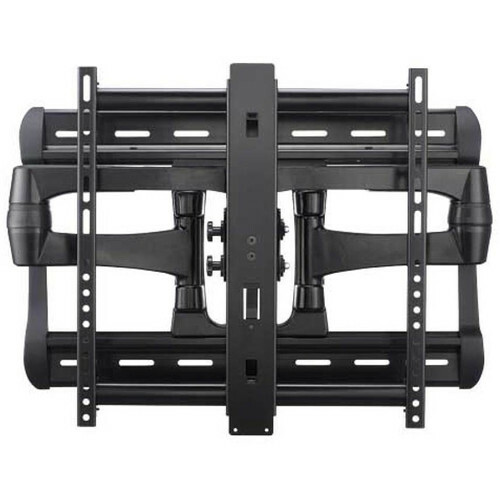 We were surprised because many wall mounts are flimsy in nature, nothing more than a few pieces of metal latched with screws, but this mount is very heavy duty, swings well and doesn't make us worry that the TV will fall. Can't think of anything that's not great about it- though we had someone install it- it needed some serious wall for attachment. Not for those who hav e very thin walls with not enough of a stud- this piece is heavy, so with the added TV it could be an issue for you. I am looking for a wall bracket that I can hang in a doctors office to have the 400mm vesa mount at a 90 degree swivle. Is there one? Not quite understanding your question? does this mount work for Samsung 65 inch LED TV's? Yeah definitely and the good thing about buying this model is that you have room to expand if you upgrade your TV in a few years because it fits up to 90'' TVs.